Ironically, while Apple wasn’t (physically) present at the 2012 Consumer Electronic Show (CES), there were more than enough companies peddling products specifically Made For iPads/iPhones (MFI). At Titoma, people are seeing a surge in requests from companies asking them to design, develop, and manufacture products that in some form or another interact with the ubiquitous i-Products. While in years past many gadgets were developed as standalone products, these days smart firms implement their idea on the Apple or Android hardware that people already have in their pockets, thus enormously speeding up sales and delivery by simply selling it as an app via the Apple store. Some people would think that would be bad news for a hardware product developer like Titoma. But the disadvantage of just selling software is of course that a potential competitor can build a clone of other people’s app even faster than they did. Having a hardware component to a product still constitutes a major barrier to entry, and buys the developer at least 6 months. That’s why many people are now looking to make devices that use the Apple hardware as the core engine and add something to make a new, more valuable product—a bit like filling in the missing bite on the Apple logo. In this way they substantially reduce the cost of their device, while simultaneously boosting their marketing because many users are so in love with their Apple products that they will buy anything that extends their device’s functionality. So it is not surprising that many companies want to capitalize on this opportunity. Apple is incredibly successful at making complex products user friendly enough to be loved by the masses. Tablets have actually been around for quite a few years now; already in 1999 the founder of Titoma Design managed the design team for the Qbe tablet which won Comdex Best of Show. But it did require Apple’s magic in user experience to really make the tablet a sales success. So what does it take to jump on the MFI bandwagon? 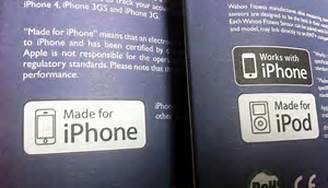 Compliance with Apple’s MFI program is a must unless you don’t mind getting sued for selling unauthorized accessories. These lawsuits show how serious Apple is in controlling all aspects of their products and ensuring that its strict quality standards (and profits) are maintained. Apple is all about a perfect user experience, and they do not want some third party device to crash one of their products and make them look bad. To start with, make sure that a mature enough idea for a product, target market, and retail price for Apple is seriously formed. The device will then need to satisfy third-party tests to demonstrate that it won’t interfere with the iOS hardware; some of these tests may include RF Over-The-Air (OTA) performance and TDMA Noise. Then, Apple will need to approve the final product design before it can start to be sold. These tests will cost US$20K or a lot more depending on the complexity of the device. Apple will also collect a flat fee for every electronic accessory sold. It also takes time, developing something for Apple tends to add about 3 months to the schedule compared to developing for Android. On the other hand the hassle with Android is that developers have a plethora of hardware and screensizes to deal with, doing it right (as Apple makes you) means optimizing for each and every one of them. Outside of the expenses associated with the MFI program, the developers also need to take into consideration the investment required in the actual designing, developing, and manufacturing your product. They don’t need to be selling a product in the millions, but it does entail selling enough to be able to make the sizeable investment worthwhile. For more on this, please read an article, ‘How Much Will It Cost to Have a New Electronic Product Developed in Asia‘ published by Titoma in 2010. So while complying with the MFI program will cost the developers additional money and time, it does guarantee that the device will work seamlessly with any Apple product; and most importantly the Apple stamp of approval is a valuable marketing tool. Overall it’s certainly worth the investment because anything associated with Apple tends to retail at twice the price. If any developer is interested in a Made-For-Apple product designed and manufactured, email Case at case.engelen@titoma.com; he’ll be more than happy to answer any questions. Titoma can ensure the device passes the testing and advise you on any necessary adjustments needed to bring the product to market the fastest way possible. Article Source: ArticleBase by Author Case Engelen . Case Engelen has extensive experiences with the industrial design and electronic engineering industry. In 1999 he founded his company Titoma Design, which has established a profile of diverse electronic products it develops for its clients. Case constantly shares his ideas of the latest trend in the market and enjoys having related discussions with his readers. How Much Will It Cost To Develop A New Product In Asia?